We are very pleased to invite you to the 2nd edition of the Power Electronics Symposium organized by IEEE Student Branch Leuven. 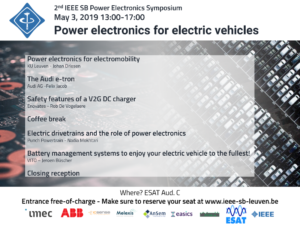 This year's topic is “Power Electronics for electric vehicles”, which will be discussed by several experts from industry and academia. 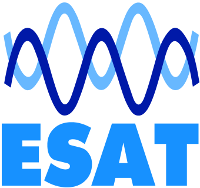 The symposium starts at 13.00 in auditorium C (ESAT), and closes at 16.30 with a reception until 18:00. Participation is free, but registration is required below. On the 13th of may the SSCS Student Chapter Leuven is organizing the 1st edition of the Microelectronics Micro Symposium. Numerous speakers from industry and academia are coming to give a talk on the topic of "The car of the future"